PIPECONX Repair Couplings are designed and manufactured to improve performance and pipe alignment in areas that require added shear strength for heavy loads. Shear Resistance: The SR and RCX line of PIPECONX Repair Couplings offer a 0.012” stainless steel shear ring increasing rigidity and corrosion resistance for non-shear applications. 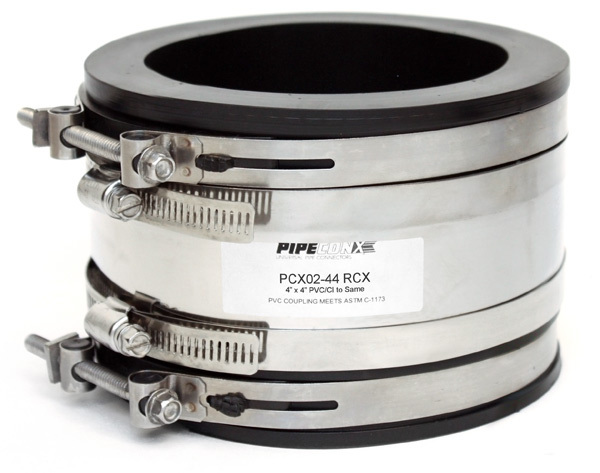 Pipe Alignment: With the molded in bushing and heavy-duty stainless steel shear ring, the PIPECONX line of SR and RCX Repair Couplings improve pipe alignment against shifting forces of compaction of soil, shifting, settling and improper backfill. Pipeconx Brand Trusted Seal: PIPECONX Repair Couplings are premium manufactured PVC gaskets with smooth sealing surfaces. The couplings, combined with stainless steel worm-gear and nut and bolt clamps, provide a uniform seal across the surface of the pipe. The addition of a stainless steel, corrosion-resistant shear ring, adds increased resistance to shear forces. All PIPECONX couplings offer excellent resistance to sewer gas, common household chemicals often found in sewer systems, ozone, fungus growth and UV resulting in decades of problem free performance providing the seal you have come to trust in DWV applications. PIPECONX flexible PVC couplings, designed for drain/waste/vent (DWV) applications, are proudly manufactured and assembled in the USA at our facility in Evansville, IN, and meet or exceed all applicable ASTM, IAPMO/UPC, and CSA standards.